These curry tofu wraps are the wrap of all wraps, and they’re bound to become your favorite. 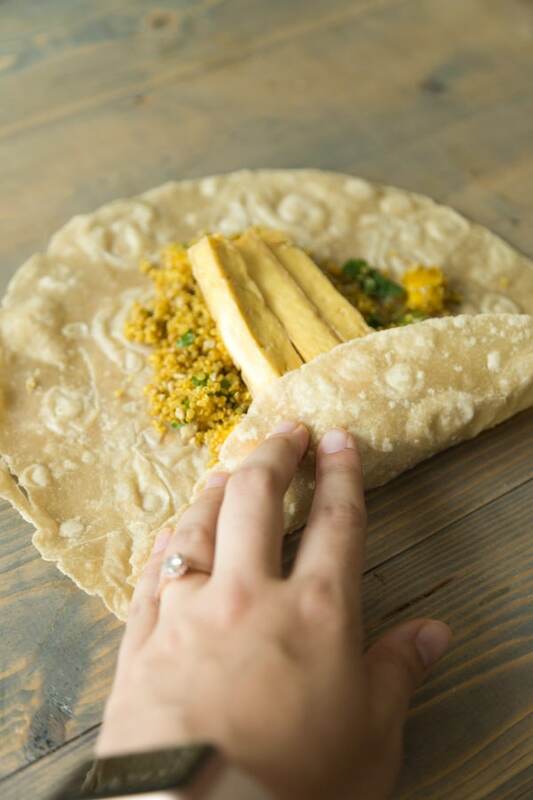 Packed tight with curried quinoa, baked tofu, sweet mango and crunchy sunflower seeds, our flavorful wrap has all the flavors and textures that you could ask for in one delicious meal. Oh lordy lordy, y’all (this is me channeling my Southern relatives), if ever there was a wrap that was worthy of gold, this is it. It has gold medal flavors, gold medal color, and gold level nutrition. Yep, we have a triple crown winner here, my friends. This curried quinoa wrap is inspired by a similar one that I had at Left Coast in Chicago. After one bite, I knew that I had to create my own version. 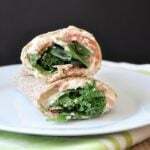 It took me a few tries to get the spice blend just right, but once I did, well, let’s just say that I’m a bit obsessed with this healthy vegan wrap. First – Press the excess liquid out of the tofu while you make the quinoa. Second – Once the quinoa is done, put it in a bowl that’s large enough to allow you to stir in the spices and other ingredients without having to worry about it falling out of the bowl. This is also the time to slice the tofu into sticks and bake it until it’s slightly crispy on the outside and nice and firm on the inside. Third – Combine the spices with the quinoa and stir until it’s evenly coated. You don’t want to see any dry spices, it should melt into the warm quinoa. Next, stir in the mango, cilantro, and sunflower seeds until combined. 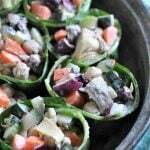 Fourth – Wrap the filling in a wrap and and enjoy! We love making wraps and burritos (they’re really the same thing), so we’ve become pretty proficient with this skill. 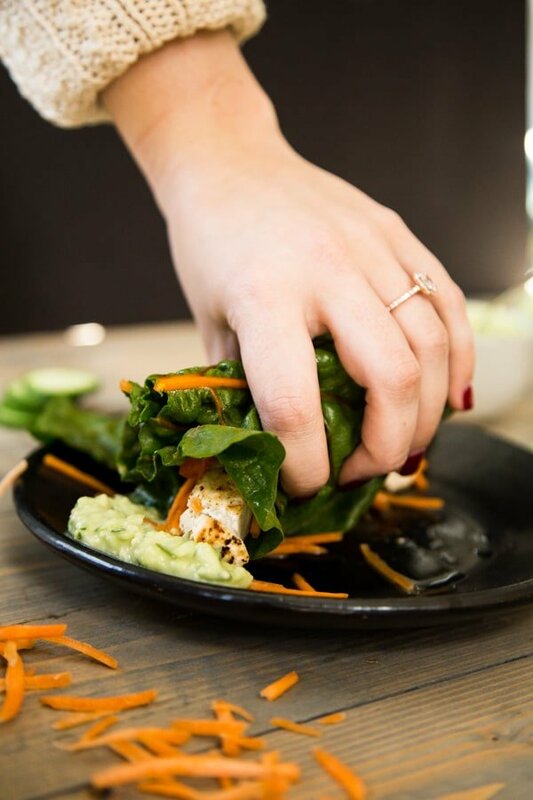 The trick to making the perfect wrap is not under or over filling it. Too little filling, and you have an anemic wrap that won’t be very satisfying. Over fill it, and you’ll have an explosion on your hands. It’s really a matter of how large the tortilla is and eyeballing exactly how much filling it will need. The good news is that you can always adjust as you’re building. You’ll want to fill the center, leaving enough room on all sides for wrapping. Fold the bottom half of the tortilla over the filling, then the top half, and then roll the sides. 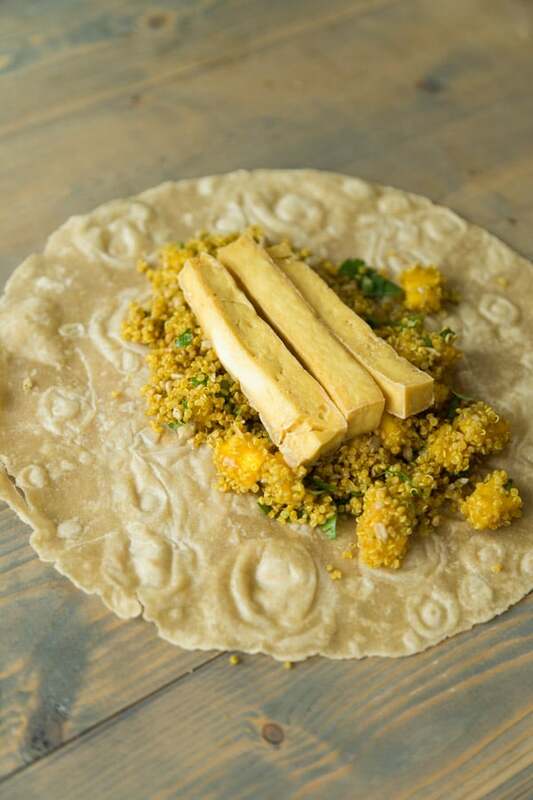 If you’re making a quinoa and tofu wrap with curry for later, you can roll it up in foil so you can take it with you. 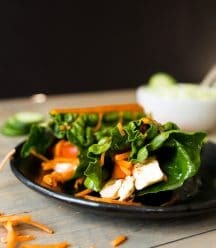 If you’re all about huge flavor and great texture, then you’re going to LOVE these curry tofu wraps! It’s super easy to make and if you’re not into wraps, you can always eat it as is. It makes a great meal regardless of how you eat it. WHICH FLAVORS MAKE THIS RECIPE GREAT? Talk about a spice that can have a million meanings. 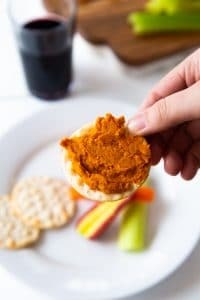 While many of us know where to find curry powder in the grocery store and what dishes to add it to, a lot of us don’t actually know that curry powder is a spice blend, not just one single spice. It’s actually a combination of coriander, cumin, turmeric, and other spices depending on the varietal. WHAT OTHER SPICES ARE WE USING? Something special happens to a dish when you combine different types of flavors. For these curry tofu wraps we’re adding a little hint of sweetness to elevate the flavor profile. How are we adding this extra flavor dimension? Through mango of course! Sunflower seeds not only add some more texture to this wrap (read about that below), but they also add an incredible dash of salt! This way you don’t have to worry about adding extra salt to the tofu, but instead can let your guests transform their wraps into a customizable dish by allowing them to choose how much salt to add through the sunflower seeds. Make sure you cook your quinoa exactly the way the instructions demand. Grains and seeds like rice, quinoa, barley, and amaranth aren’t a guessing game when it comes to cooking. The water ratio to grain ratio is extremely important to follow. Over pour your water and you’ll wind up with undercooked quinoa swimming in a lake of murky water. Don’t pour enough in and you risk burning the tofu and your pan. PRO TIP: keep a written list of grain cook times along with water to grain ratios in an easy to reach location! 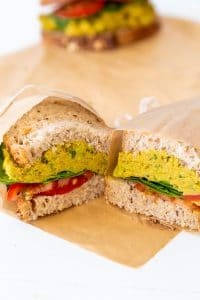 HOW DO I MAKE THE PERFECT TOFU FOR THESE CURRY TOFU WRAPS? 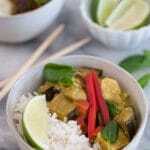 The tofu in these curry tofu wraps is key in making the texture appeal to your diners. Raw tofu manifests in a white, bouncy, and watery block. It’s not super appealing to the masses and is likely to get a couple up turned noses when lunch time rolls around. I know! Now you’re probably wondering “well how do I get this stuff to taste good?” Don’t worry, we’ll walk you through it. First you need to choose what type of tofu you’re going to use. 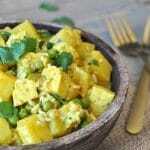 This particular recipes calls for super firm or extra super firm tofu. This is because super firm tofu will hold it’s form while being man-handled in a pan. 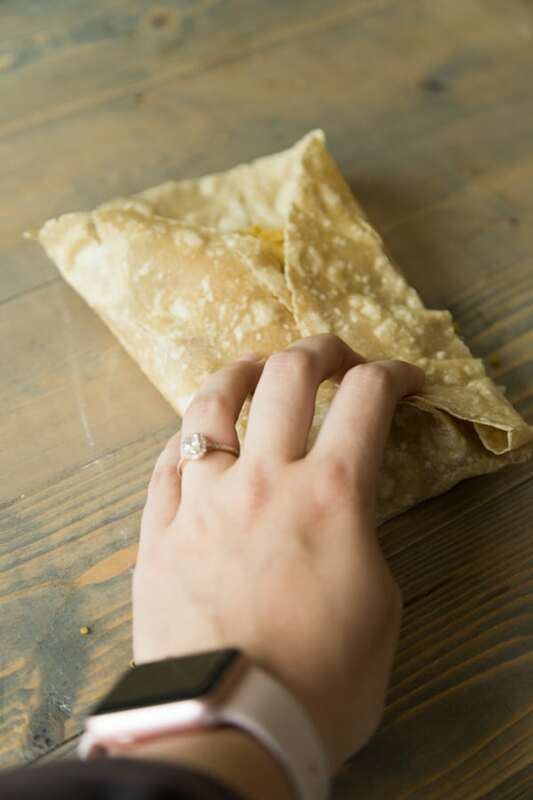 It also is less water-dense which means it won’t make your wrap a soggy mess. Now that you’ve selected your tofu all you have to do is press it, marinade it, and seer that tofu on all sides to create a pocked of soft tofu soaked in a delicious sauce with a crispy outer layer. Trust us, this makes for one awesome tofu wrap. HOW DO I CHOOSE THE BEST MANGO? Touch – the mango should be slightly soft (like a ripe avocado) and ooze a little sap by the stem when pressed. Color – the mango should be mostly orange. Smell – ripe mango smells sweet and like… well… a mango! If the mango has no scent or smells slightly rancid toss it! If those three basic tips don’t seem like enough to help you pick out the perfect mango then head here to read more about what a ripe mango should be. When making an awesome meal, it’s so important to consider texture. Too many times I’ve sat down to a meal that’s been all crunchy, all mushy, etc. It’s something that’s easy to forget but can truly make or break a dish. 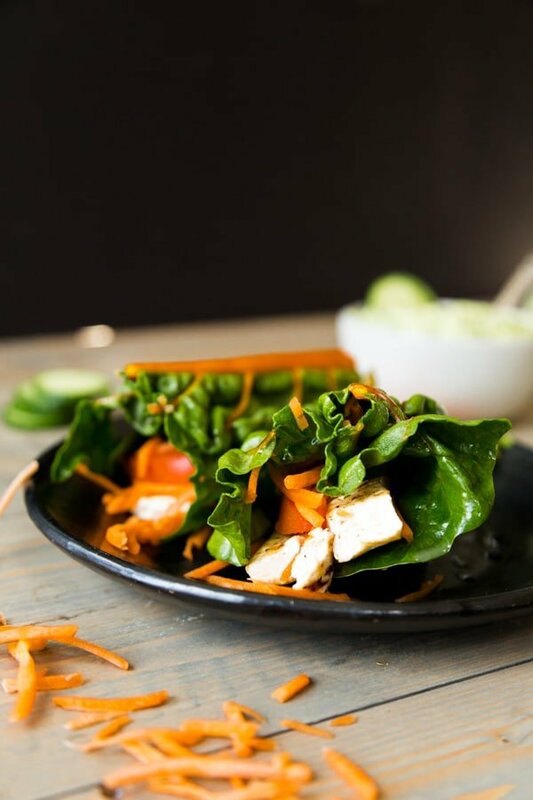 In these curry tofu wraps we used sunflower seeds to add a little extra crunch! The mild flavor of the sunflower seed along with it’s smaller size and the fact that it’s easy to find in any grocery store make it the perfect addition to nearly any wrap, salad, or hot meal. Just sprinkle on as much or as little as you prefer and enjoy your textural paradise! 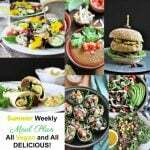 A healthy, flavorful and easy curried quinoa, mango and tofu salad wrap that’s perfect for any meal of the day. Press the excess water out of the tofu, approximately 20 minutes. Once pressed, slice the tofu into sticks and bake for approximately 15 to 20 minutes, or until the exterior is slightly crispy and the center is firm. Cook the quinoa according to the instructions. We measured out a ½ cup (105 g) of uncooked quinoa and saved leftovers for later. Transfer the quinoa to a bowl that’s large enough to allow you to stir in the rest of the ingredients without spillage. Stir in the spices and maple syrup until fully combined. You don’t want to see traces of dry spices, they should melt into the quinoa. 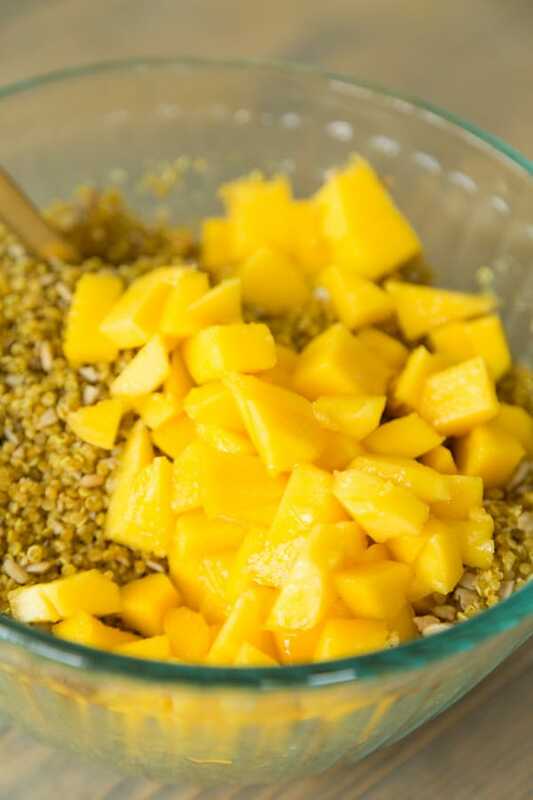 Stir in the mango, sunflower seeds and cilantro until fully combined. Build the wraps. Spoon filling into the center of the wrap, leave enough room on each side to fold. Put a few pieces of tofu on top of the quinoa. The amount will depend on how large the wrap is. See instructions and visuals in the post. Fold over the bottom of the wrap (the bottom should be where the ends of the tofu are for easier folding), then the top, then one side and roll. Tuck the ends. See the photos in the post for visual instruction. The Nutritional Facts are an estimate only If you want to make this gluten-free, you can buy GF wraps, just know that they’re more prone to breaking as they’re not as flexible as those made with gluten. You can also eat it as a salad if you don’t want the carbs from the wrap. 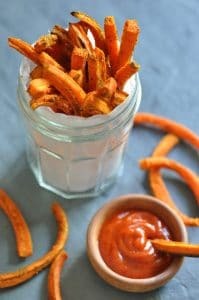 Yum, these sound wonderful - great flavor combo and ingredient list. Seem very hearty and filling, thanks! Thank you! Yes, they're really hearty, yet light at the same time.